The Advertising Standards Authority for Ireland (ASAI) is investigating claims that the ads, appearing in Dublin’s train and Dart stations and on buses, are misleading. The billboards and posters feature photos of five downtrodden looking workers. “When job security turns into insecurity, success begins with personal efficiency,” they advise, urging people to “attend a course in Scientology”. 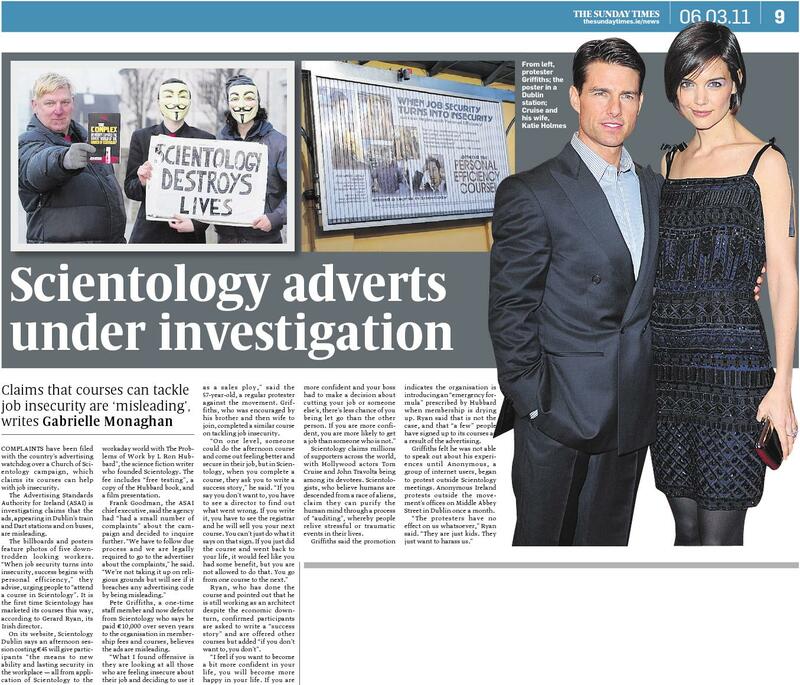 It is the first time Scientology has marketed its courses this way, according to Gerard Ryan, its Irish director. On its website, Scientology Dublin says an afternoon session costing €45 will give participants “the means to new ability and lasting security in the workplace — all from application of Scientology to the workaday world with The Problems of Work by L Ron Hubbard”, the science fiction writer who founded Scientology. The fee includes “free testing”, a copy of the Hubbard book, and a film presentation. Pete Griffiths, a one-time staff member and now defector from Scientology who says he paid €10,000 over seven years to the organisation in membership fees and courses, believes the ads are misleading. “What I found offensive is they are looking at all those who are feeling insecure about their job and deciding to use it as a sales ploy,” said the 57-year-old, a regular protester against the movement. Griffiths, who was encouraged by his brother and then wife to join, completed a similar course on tackling job insecurity. Ryan, who has done the course and pointed out that he is still working as an architect despite the economic downturn, confirmed participants are asked to write a “success story” and are offered other courses but added “if you don’t want to, you don’t”. Scientology claims millions of supporters across the world, with Hollywood actors Tom Cruise and John Travolta being among its devotees. Scientologists, who believe humans are descended from a race of aliens, claim they can purify the human mind through a process of “auditing”, whereby people relive stressful or traumatic events in their lives. Griffiths said the promotion indicates the organisation is introducing an “emergency formula” prescribed by Hubbard when membership is drying up. Ryan said that is not the case, and that “a few” people have signed up to its courses as a result of the advertising. Griffiths felt he was not able to speak out about his experiences until Anonymous, a group of internet users, began to protest outside Scientology meetings. Anonymous Ireland protests outside the movement’s offices on Middle Abbey Street in Dublin once a month.